The planned Energy Tower now has its own Wikipedia page, so it will inevitably be built, because they can't put anything in Wikipedia that's misleading, right? That means that a large number (or small number or a handful or one-or-two) Midlanders will be inconsolable over the demolition of the now-vacant county courthouse occupying a full block of prime downtown real estate, citing its historical significance or some such illogical sentimentality. Don't get me wrong. I'm all for saving/restoring/using truly historical structures, especially when the architecture is unique or even notable. I'm afraid that our courthouse qualifies on neither account. It was built in 1930, and might be a candidate for protection in its original condition, but it was remodeled in the early 1970s and whatever unique qualities it may have exhibited were plastered over by a shiny new and very unremarkable façade. It has all the grace and charm of a Motel 6, no offense to Motel 6 of course. It's the Pontiac Aztec of Texas courthouses. The building now stands empty, as the former tenants couldn't wait to vacate the premises for more modern, livable, non-flooding, non-vermin-infested quarters in a high rise in another part of downtown. That's no slam against Midland. West Texas has more than its share of unremarkable county courthouses. Jump over to this page and hover over the various counties and you'll see a wide range of architecture, ranging from classic (e.g. Jeff Davis and Crockett Counties) to early modern bureaucratic (e.g. Ector and Martin Counties). In any event, a building constructed in the 70s certainly hasn't the bona fides to compete with, say, the Cass County courthouse in Linden, Texas, which was built in 1961 and is still in active use for its original purpose. 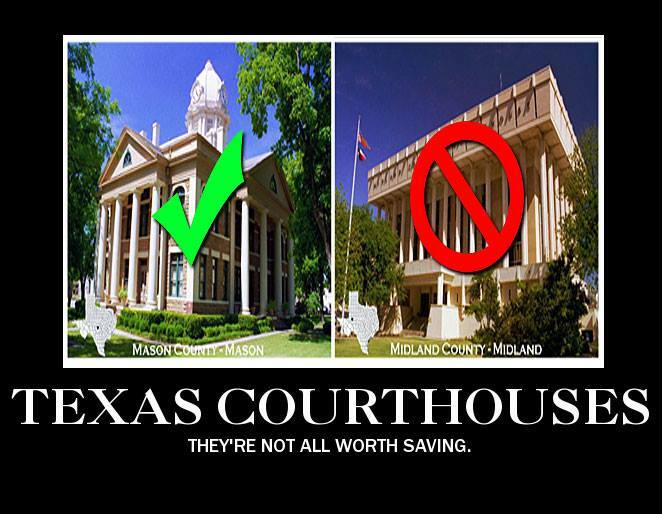 Even if the courthouse building displayed its original architecture, given that it's not being used for anything else and Midland has more than its share of museums and libraries, I would argue that reusing that real estate for something more attractive and practical just makes good sense. But as a 70s relic, I'll shed no tears over its demise. This page contains a single entry by Eric published on May 20, 2013 6:30 AM. Birding from the comfort of home was the previous entry in this blog. Rain/Dance is the next entry in this blog.